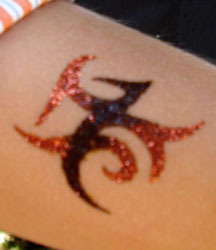 Turn ordinary days, parties and events to a sparkling, shimmering bash with glitter tattoos! 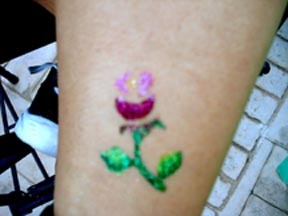 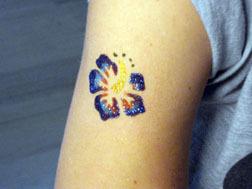 Decorate your body with butterflies, flowers, dragons, hearts, tribal designs, Chinese characters, fireflies, and more! 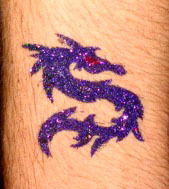 Whether you're looking for entertainment to liven up a party, jazz up an evening, entertain around the pool, or maybe a school reunion - let our glitter tattoos do the work! 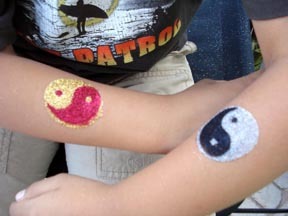 Only skin tested special ultrafine, cosmetic grade glitter powder, as well as hypoallergenic cosmetic glue is used in applications. 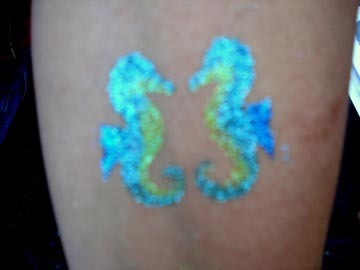 Will Last 1-3 days depending on skin type and placement. 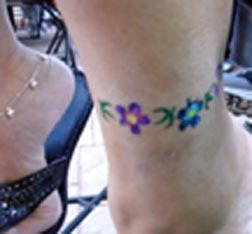 If so desired, can easily be removed with baby oil, moisturizer or rubbing alcohol.